After a rocket attack from Gaza into the Israeli city of Ashkelon on Tuesday morning, Israel warned Gazans that an air stike would come soon. Knowing that Israel has promised a disproportionate response to Hamas rockets, the rockets continue to come from Gaza. And Hamas is shooting them. After Tuesday’s rocket attack, recorded messages, in Arabic, said people who work in tunnels, live near them or are “giving logistical help to terrorists” should evacuate the area immediately, residents said. On Sunday, the IAF launched strikes against Hamas installations and smuggling tunnels throughout Gaza in response to the more than 15 rockets and mortar shells fired at southern Israel by Gaza terrorists throughout the day. 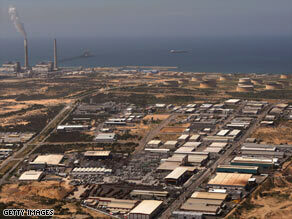 This aerial view shows the power station and industrial zone of Ashkelon, Israel, in March of 2008. Militants in Gaza apparently fired four more rockets into Israel Sunday, shaking the already unsteady cease fire. 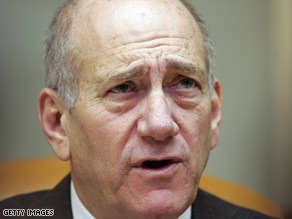 Israeli Prime Minister Ehud Olmert says Israel’s response will be “disproportionate” if rocket attacks continue. “We won’t return to the rules of the game that terror groups have tried to dictate and we won’t be dragged into a never-ending shooting war,” said the prime minister, stressing that Israel would not allow the rocket attacks to continue. 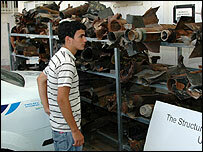 Israel attacked Hamas in Gaza on December 27 with the stated aim of ending rocket attacks on southern Israel. More than 1,300 Palestinians died and about 5,400 others were wounded. Thirteen Israelis, including 10 soldiers, were also killed in the fighting. It seems that whenever Israel responds to violent overtures from groups such as Hezbollah and Hamas, leaders of the international community are quick to assign equal condemnation to Israelis and Palestinians regardless of whether one is legitimately acting in self-defense. Whether it is due to a latent anti-Semitism, the desire to avoid inflaming fundamentalist Arab passions, or simply an unrealistic belief in equality, world leaders are focusing too much on buzzwords. In the case of Israel, the buzzwords are the “disproportionate” and “excessive” use of force – terms used in the 2006 Lebanon war and most recently spoken by French President Nikolas Sarkozy and UN Secretary-General Ban Ki-moon in response to Israel’s Gaza offensive. This is a particularly puzzling criticism of Israel. Would the international community truly prefer a proportionate or equal response? If Hamas launches three crudely-fashioned rockets into Israel, should the Israeli government respond with three equally-crude rockets? If three Israeli Defense Forces are kidnapped by Hezbollah, should the IDF respond by kidnapping an equal number of Hezbollah foot-soldiers? The notion of “proportional” response lacks both merit and logical support for several reasons. In war, there are winners and losers, and the only palatable means of victory come from a disproportionate use of force. Victors are inherently more skilled in combat, tactics, and in the effective deployment of (generally superior) technology. On Saturday evening, when Israel’s Prime Minister Ehud Olmert addressed Gazans directly in a speech, telling them that Israel did not want them to suffer, that Hamas, not ordinary Gazans, were Israel’s enemy, his words were met with bitter scepticism. Israel says it has been forced to act to stop the constant rocket and mortar shell from Gaza, aimed at Israeli towns just over the border. Palestinians describe Israel’s actions as disproportionate. One Israeli civilian was killed by rocket fire on Saturday while medical sources in Gaza say they expect the death toll there to reach 250. Israel argues that, while most Gaza rockets are not deadly, they are designed to be. The quarter of a million Israelis who live close to the Gaza border say they live in fear, never far from a bomb shelter. Many are delighted their government is finally taking concerted action but they are scared, too, of Hamas reprisals. Hamas’s military wing has vowed to open the gates of hell. The movement’s exiled political leader, Khaled Meshaal, has called for a third and violent Palestinian uprising. You are currently browsing the archives for the Disproportionate category.